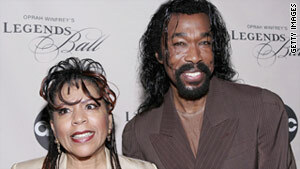 Nickolas Ashford, along with his wife and songwriting partner Valerie Simpson, wrote some of Motown's biggest hits. They wrote songs such as "Ain't No Mountain High Enough" and "I'm Every Woman"
The two also performed themselves; their hits included "Solid (As a Rock)"
(CNN) -- Nickolas Ashford, one-half of the successful Motown singer-songwriter duo of Ashford and Simpson, died Monday afternoon, his longtime former publicist said. Liz Rosenberg, who in addition to having been their publicist described herself as a close friend of Ashford and his wife Valerie Simpson, said she was "heartbroken" to hear of Ashford's death. "He was a true king," she said. "I loved him very much." Ashford had been battling and was being treated for throat cancer, and Rosenberg said she believed his death "was quite sudden." His wife and children were at his bedside when he died, she said. He was 69, reported imdb.com and numerous other sources. According to their MySpace page, Ashford and Simpson met in 1964 in New York City. Within two years, as songwriters with Scepter Songwriters, they scored their first hit with Ray Charles' "Let's Go Get Stoned." The couple then joined Motown Records, where they wrote a host of popular songs for the likes of Marvin Gaye, Tammi Terrell and Diana Ross including "Ain't No Mountain High Enough," "Ain't Nothing Like the Real Thing" and "Reach Out and Touch (Somebody's Hand)." Later in their careers, their songwriting credits included Chaka Khan's "I'm Every Woman." In the '70s, Ashford and Simpson went from songwriters to performers, releasing nine albums for Motown, Warner Brothers Records (like CNN, a division of Time Warner) and Capitol Records between 1973 and 1984. Their biggest hit during that time was the song "Solid (As a Rock)." On stage, Ashford typically sported long curly hair, a goatee and a knack for hitting high notes. In 1996, he established the Sugar Bar, a restaurant and live entertainment venue in Manhattan's Upper West Side. According to its website, the bar showcases soul, jazz, Caribbean, African and other types of music and has been visited by numerous guests over the years such as Bruce Willis, Stevie Wonder, Maya Angelou and others. The Songwriters Hall of Fame inducted Ashford and his wife in 2002, calling them "one of the most prolific and versatile musical couples in recording history."